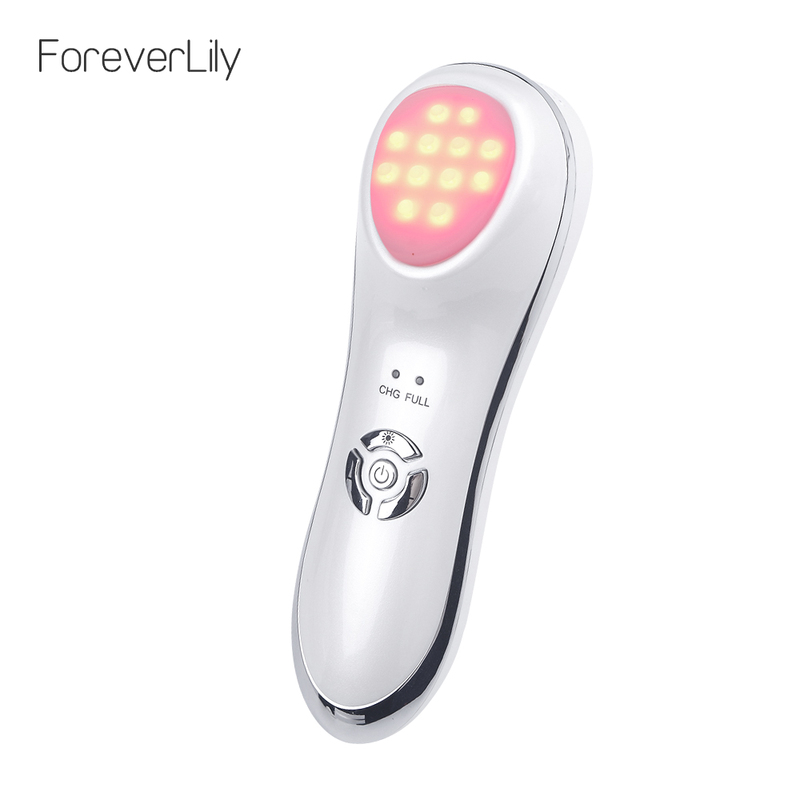 Red light: Enhance cell activity, promote blood circulation, increase skin elasticity, and improve the dull skin condition. Green light: Soothe vascular dilation, regulate skin gland function,improve sensitive skin. Blue light: Eliminate and inhibit the emergence of acne, promote the synthesis of protein and collagen, activate skin, tighten the loose skin. Yellow light: Stimulate microcirculation, improve cell oxygen alternation, dilute spots, inhibit and decompose melanin, brighten skin tone. Purple flashing light: Strengthen the gel absorption, whiten skin. 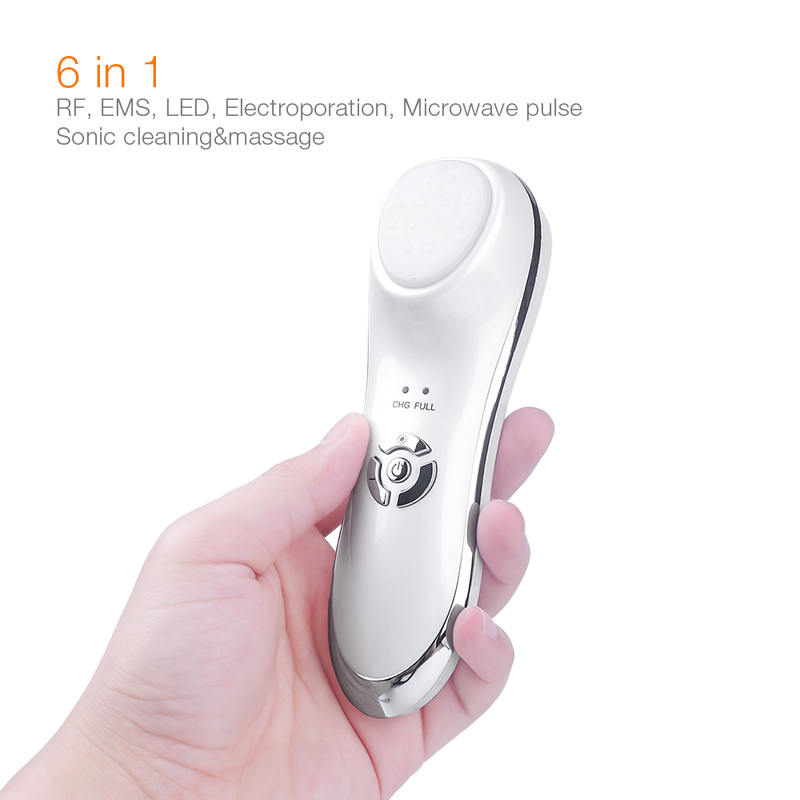 Combined with ultrasonic vibration, the beauty effect will be better. USB charging, you can charge it through computer or any other USB powered port under DC 5V 500mA power supply. 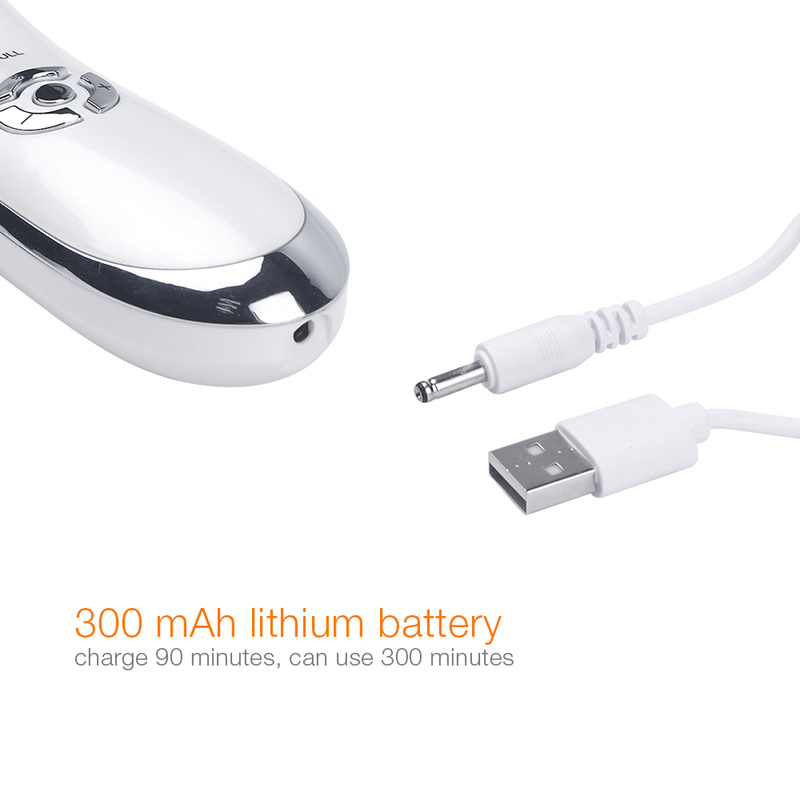 Built-in rechargeable battery, after 2 hours full charge, it can work continuously for about 300 minutes. 1. 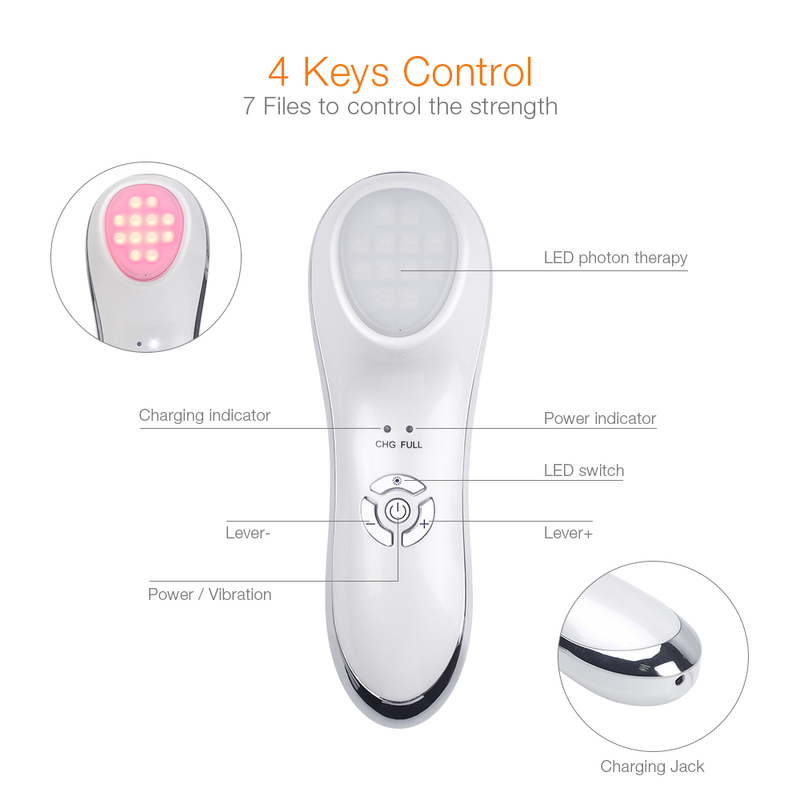 Long press the “power” key for 3 seconds, power indicator(FULL) shows blue light, which is indicated to enter into the preset mode of“LED photon therapy-Red led light: the 4th levelâ€?br>2. 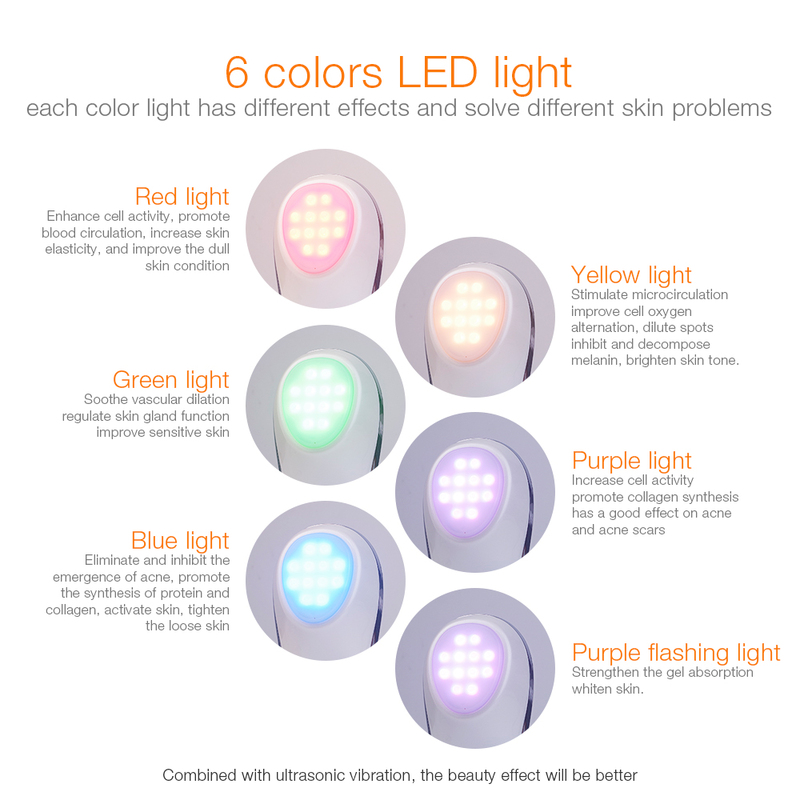 Then you can choose different LED color of photon therapy mode by “LED switch” button, 6 colors LED light for your choice: red / green / blue / yellow / purple / purple flashing. 3. If you want to adjust the LED color level, please press â€?” key to brighten the light, press â€?” key to dim the light. 7 levels for your choice, the 4th level is the default level after the device powers on. 4. As the device is in the state of power-on, please press the “power” key to start the vibration mode. Long press the “powerâ€?key for 3 seconds or it works for 15 minutes continuously, the device will turn off automatically. 5. After any mode was selected, it will start timing of 900(±15) seconds. During the period of timing, you can switch the light level or the LED colors. The timekeeping time 900 seconds is not over until the device powers off automatically. If you switch the mode, the timer's time schedule will return to zero. 6. If the device is in the state of weak power, red indicator(CHG) will flash. It shows that you should charge it immediately. Children under the age of 15 and adolescents are not suitable to use the product. 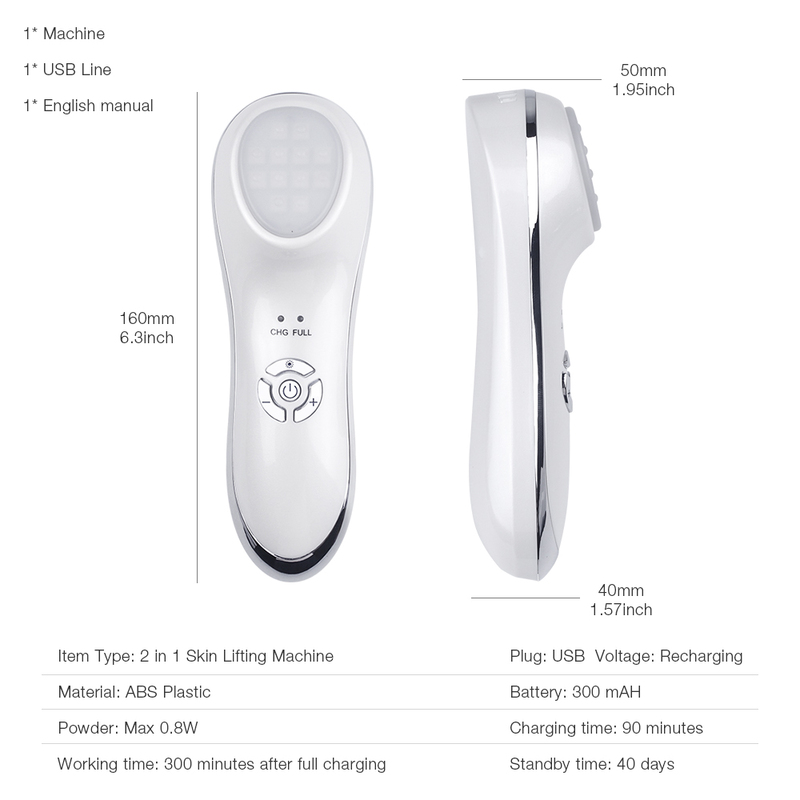 Pregnant women, or people with heart disease, acute disease, fever, abnormal blood pressure, hypoglycemia, hypertension, allergic inflammation, sensitive skin and etc conditions are not suitable to use. The following body parts are not suitable to use: Plastic surgery treatment area, eyeball and eyelash, injured area, lip, facial mucosa herpes, facial pain or abnormal perception area, skin implanted metal, plastic or silicone, etc. Please remove earrings, necklace and contact lenses before using this device. If skin abnormalities appeared during use, stop using the product immediately. After using, if there is dirt on probe, please clean or wipe it by soft cloth or napkin and put the device in a dry place.